Shahid Khan, from left, owner of auto supplier Flex-N-Gate, and Detroit Mayor Mike Duggan speak with plumber Aaron Barners during a tour of Flex-N-Gate's new auto parts factory in Detroit on Monday. 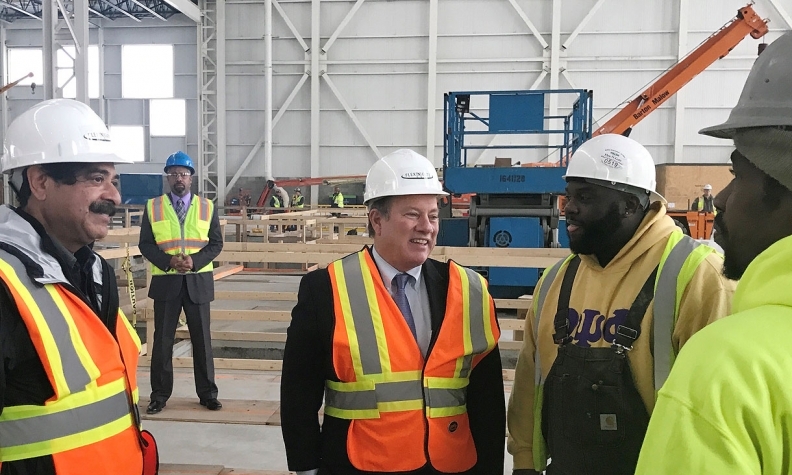 DETROIT -- Days after Detroit lost out in the race to host Amazon.com Inc.'s second headquarters, the city's mayor and the billionaire owner of auto supplier Flex-N-Gate Corp. offered a sneak preview of what will be the largest new auto factory built in the city since the 1990s. The $160 million plant will make metal and plastic parts for Ford Motor Co. vehicles and is projected to employ more than 400 people when it opens in October. For Detroit, the plant represents a more realistic, smaller scale approach to bringing jobs back to areas of the city abandoned as manufacturers left for the suburbs, other states and overseas. "This is the way we'll go about employing" city residents, "four or five hundred jobs at a time," Detroit Mayor Mike Duggan said on Monday during a walk through the cavernous plant on Detroit's east side. The plant is about 60 percent complete. Large pits in the concrete floor marked where metal forming presses will stand. Shahid Khan, owner of Flex-N-Gate and the NFL's Jacksonville Jaguars, said Ford urged him to consider locating the factory in the city, an idea Khan said he supported. Duggan said the city helped locate the property and will pay for training workers. Khan did not say how much jobs at the factory will pay but he expressed support for the idea of a $20 an hour wage "to break the cycle of poverty." Jobs at the plant will require "more brain power and less muscle," Khan said, as workers operate automated presses and other equipment. The investment resulted from a collaboration of Flex-N-Gate, Ford and the city to train city residents to work in an automated factory.